I saw the the recipe for roasted grapes with sausage on the episode of Barefoot Contessa (Ina Garten) a couple of years ago, and always wanted to try it. The problem was that fresh grapes don’t last in our house, everybody loves them fresh, and we rarely buy sausage, I’m not a fan. 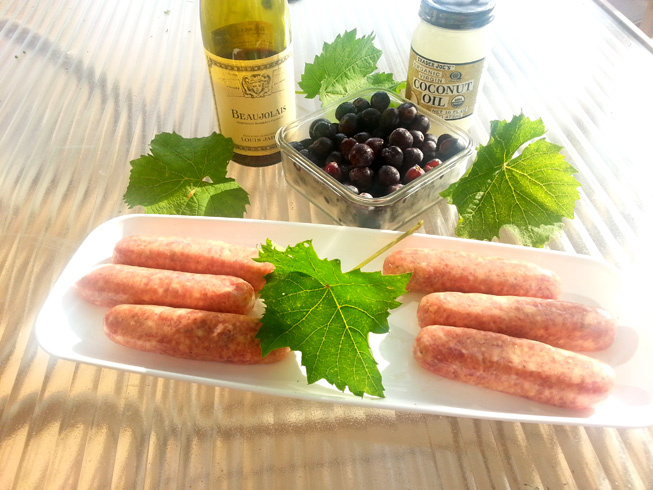 Yesterday my husband went shopping, and among the things on the list he bought the sweet Italian turkey sausage, and It just so happened that I had about two cups of grapes left in the fridge. This meal comes together in about half an hour, and it’s just delicious. in a roasting pan toss grapes,oil and red wine and cook for 2 minutes on medium high heat. Add sausages to roasting pan. Place pan in the oven, cook until the sausage browns on one side, turn sausage oven and cook on the other side. Remove pan from oven, add balsamic vinegar and cook for 3 more minutes on medium high flame.